We first released this decidedly indelicate beer in 2012, as Stone Ruination Tenth Anniversary IPA, to celebrate the 10th anniversary of our belovedly bitter Stone Ruination IPA. 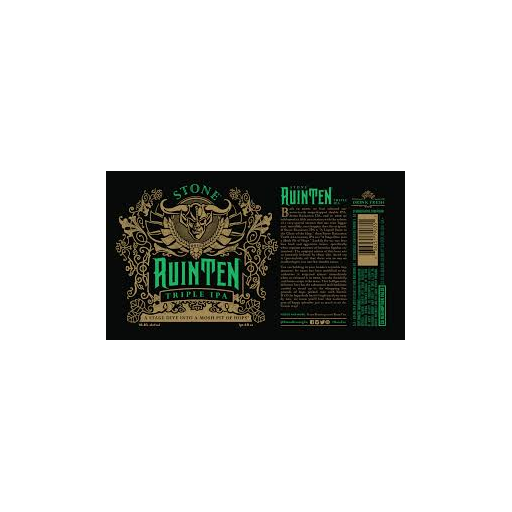 Stone RuinTen IPA uses the same recklessly hoppy recipe as the 2012 release; only the name has changed, as we plan to unleash this belligerently delicious hop monster upon the public annually from now on. We packed a whopping five pounds of hops into each barrel, and cranked up the ABV to stand up to the hop onslaught. The results are glorious, and we know you'll rejoice in tasting this audacious gem of hoppy splendor once again. You're welcome.